You must register for each session your camper wants to attend. Once you complete the registration form, you can then click through to pay online, or you can mail a check to Ovation West, PO Box 2103, Evergreen CO 80437. Ovation West’s (formerly known as the Evergreen Chorale) Summer Music Camp invites aspiring performers ages 7 to 18 to improve their singing, acting, dancing and stagecraft. From June 3-14, we offer two one-week sessions for kids in grades K-2 and 3-5, and two-week intensives for middle and high schoolers to learn and create showcase performances with songs and scenes from selected musicals. Each section of camp has two musical theatre instructors as well as dedicated time each day with professional choreographers and accompanists. 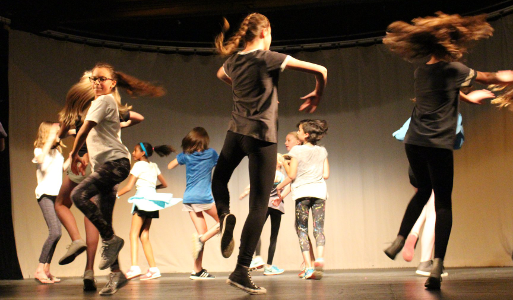 Our camp is held at Center Stage in Evergreen where each group has time on stage each day. Parents and friends are invited to a showcase on Friday afternoons for the K-2 and 3-5th grade groups, and on the final Friday evening (June 14 at 7:00pm) for the middle and high school groups. Campers should register for the section corresponding to the grade they will be entering in August 2019. Camp times are 9:00am – 12:00 noon for K-2; 9:00am – 3:00pm for 3-5; 9:00am – 3:30pm for middle and high school. THANK YOU AND WE LOOK FORWARD TO SEEING YOU AT SMC THIS JUNE!! IF YOU HAVE QUESTIONS OR NEED MORE INFORMATION, PLEASE CONTACT CHRISTINE EMERY, BUSINESS MANAGER & CAMP REGISTRAR, AT CEMERY@OVATIONWEST.ORG OR CALL (303)674-4002 AND LEAVE A MESSAGE – SHE WILL RETURN YOUR CALL WITHIN TWO DAYS. Namaste! 2018 participants try their hand at yoga with Kasie Altamura.